Gladys McLean wished to give 101 toys to children in need for her 101st birthday, and the second-grade class at Indian Springs Elementary School, a neighbor of McLean’s retirement home, Sodalis Stone Oak, took on the challenge with a toy drive. The centenarian’s wish came true Tuesday when about 12 second graders from the school walked over to deliver the toys to the birthday girl during her birthday celebration. In fact, the entire class of 146 second graders along with the Indian Springs community doubled McLean’s birthday wish by collecting 202 toys for the U.S. Marine Corps Toys for Tots program. “It’s wonderful to see the kids giving all these toys in Gladys’ honor,” said U.S. Marine Gunnery Sgt. Kevin Dahlin, the coordinator for the 2018 San Antonio Toys for Tots campaign. With 6,500 children on the list so far this year in need of toys, the donations will go to good use across San Antonio and in eight surrounding counties. Visit san-antonio-tx.toysfortots.org for more information. This is the second year that Indian Springs students have helped McLean’s birthday wish come true. Last year on her 100th birthday, she asked for 100 blankets to be donated to those in need, and the students happily granted her wish. They can’t wait to see what her wish will be next year. While McLean’s actual birthday is next Tuesday, Nov. 20, the birthday girl enjoyed celebrating early with her neighbors and fellow residents. The music, balloons, cake and punch just made the celebration sweeter. Happy 101st Birthday, Gladys! 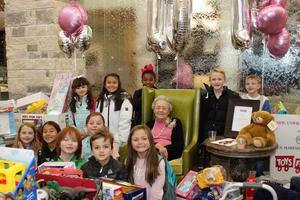 Twelve second graders from Indian Springs delivered 202 toys to Centenarian Gladys McLean in honor of her 101st birthday, doubling her wish for one toy for every year of her life. Coordinator for the 2018 San Antonio Toys for Tots campaign, Gunnery Sgt. Kevin Dahlin, accepted the donation of 202 toys in honor of Gladys McLean’s 101st birthday. Indian Springs Elementary School Principal Marisa Wulfsberg, standing, and McLean’s daughter, Sharon Sparrow were on hand to celebrate as well.